Summer is here and that means one thing – Margaritaville at the Park is in full swing! Glasses off to the Rays! Get a pair of shades with your Margaritaville group ticket. 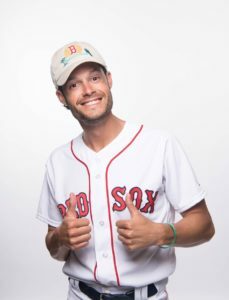 This special night will include a pre-game concert on Yawkey Way by The Island Castaways Band and a limited-edition Margaritaville Red Sox hat to get you ready for summer. Escape to Margaritaville at Target Field on Saturday, June 2nd when the Twins take on Cleveland at 3:10 p.m. This special ticket package includes a ticket to the game and an exclusive Margaritaville-inspired Twins Hawaiian shirt! Escape to Coors Field for a fun-filled, beachy evening featuring a pre-game rooftop performance by a live tribute band! Each ticket purchased includes a Rockies Margaritaville-themed shirt. Get to the game early for a Margaritaville Block Party on Federal Street, featuring live music by Tom Watt & the Fruitcakes, food, alumni autographs and more! Any game ticket allows you access to all the fun! It’s Sunday Funday for Margaritaville Night at Minute Maid Park! Fans who purchase* the special theme group ticket will also get a Margaritaville-inspired Astros t-shirt. *The Astros will only accept purchases from TX and LA issued credit cards for this promotion. It’s 7:15 Somewhere! 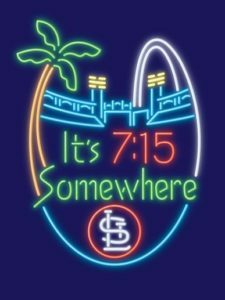 For the third straight year, The Boat Drunks will play a pregame concert and fans that purchase a special theme ticket will get a Cardinals t-shirt inspired by the Margaritaville state of mind. This special package includes an exclusive Shark bobblehead plus your ticket to the June 29 game. Plus, enjoy a fireworks show after the game set to a Margaritaville-themed soundtrack! This theme ticket includes a pair of Margaritaville-inspired sunglasses, complete with a bottle opener on the arm. And wear your sunglasses at night for a pregame party with live music from a Buffett cover band. Join the Blue Jays on Friday, July 6 in the WestJet Flight Deck for live music and entertainment where it will be 5 o’Clock somewhere all night long! The first 20,000 fans to enter Rogers Centre will receive a Blue Jays Bucket Hat. Support the Nationals as they take on their NL East division rival Atlanta Braves. Tickets include a $10 concessions credit and the first 500 people to arrive and show their Margaritaville ticket receive an exclusive Washington Nationals Margaritaville themed t-shirt! Plus, enjoy live entertainment, games and giveaways before the first pitch. Escape to Citizens Bank Park for the Phillies inaugural Margaritaville Night! Join Parrot Heads, beach lovers and baseball fans for a night of fun in paradise on Monday, August 27 at 7:05 p.m. when the Phillies host the Washington Nationals. The first 2,000 fans to purchase tickets for this promotion will receive a coupon for an exclusive Phillies Margaritaville Night T-shirt giveaway and a portion from each ticket sold for this event will benefit Singing For Change. Join the Marlins as they make the ballpark your paradise. Arrive early to lay back, relax and enjoy the pregame festivities. 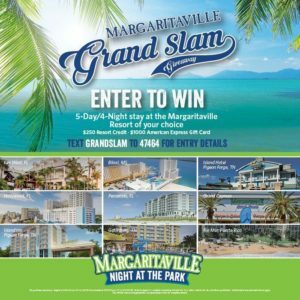 All Parrotheads, beach bums, and baseball fans that purchase a bundled ticket package will receive an exclusive Margaritaville item. 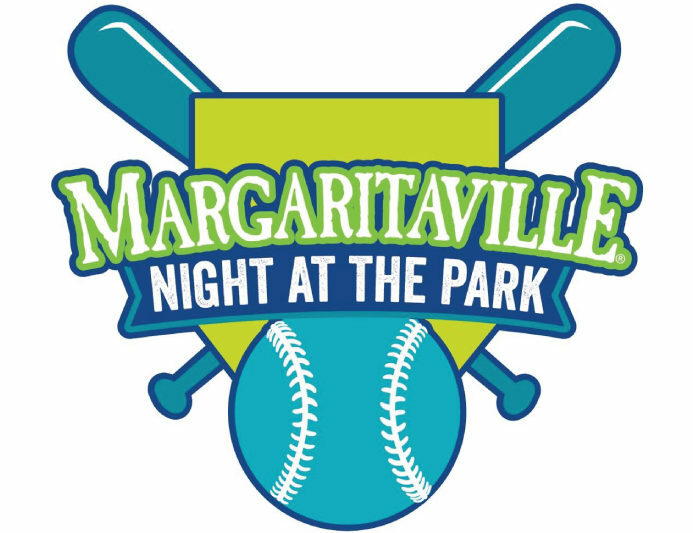 Calling all pirates and parrotheads – the White Sox are hosting Margaritaville at the Park! Bring your fins to left and right field and enjoy a night of Jimmy Buffett tunes at Guaranteed Rate Field. 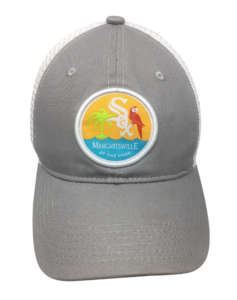 The first 1,250 fans to purchase tickets with the promo code MGV will receive a commemorative Margaritaville White Sox Hat. The promo code MGV must be entered to receive a hat voucher with your tickets. Keep summer rolling with Margaritaville Night at Citi Field. This ticket package includes a pregame concert by Parrotbeach at Fan Fest and a limited-edition Margaritaville/Mets co-branded t-shirt. Shake Shack and the Cantina will be selling cheeseburgers and Margaritas exclusively to attendees during the pregame concert! And be in your seats for the first pitch to catch Escape to Margaritaville cast members sing the National Anthem.